Requirements: The game requires a solid CPU for steady rendering; though the graphics are simple, the physics may be a burden on your CPU. Performance: For the best performance in game, make sure all other browser windows (and tabs), background apps, etc. are closed. Especially close video browser windows & tabs (ie. youtube/netflix/hulu/twitch, etc.) which will cause your FPS & bandwidth to fluctuate and lower. Bandwidth/Ping: The game requires a solid internet connection & ping for gameplay smoothness. Disable any torrents, streaming video/audio, etc. on your network to get the best bandwidth possible to the game servers. All keys noted are the default controls, you can login to change your keybinds. Move/Run: Use the standard WASD keys to move your player. *Keep in mind, shooting while running considerably diminishes accuracy. Aim: Use the MOUSE to aim, but don't lose focus of your player! Play your bunkers tight and find good angles to shoot. *Remember, if you can hit them, they can potentially hit you back; play tight and maneuver your opponents. Shoot: Click/Spam BOTH Left and/or Right mouse buttons quickly to shoot. Try to get a fast rhythm (walk the trigger) to shoot the best ropes! (Pump guns): Press Left mouse button to shoot. Press Right mouse button to pump. Try to get a steady rhythm to shoot a little faster. Slow/Bunker play: Probably the most important key in the game! Hold Shift to slow your player down to make smaller movements. Use Shift to play your bunkers tight and keep your accuracy at its highest while shooting those lanes! Accurate & methodical play wins matches! Crouch/Prone: Press C to toggle, your player is darker when crouched. Crouching allows you to hide behind lower bunkers (the darker/saturated colored bunkers are always lower, usually the snake etc.) Play your lower bunkers tight, they can be shot over and you will be hit if you are playing them too loosely! Swap shooting shoulder: Press Q or E to move your marker from left to right shoulders. Use this correctly to play your bunkers extra tight and to help expose yourself as little as possible while taking those snap shots. Reload: Press R to reload. A pod will be used and fill roughly 80% of your hopper. You only have a limited amount of pods, so use them wisely. *Single tapping R will only reload if you have less than 50% paint (to not waste a pod.) However, if you want to force a reload at any time, you can double tap R.
Swab: Press F to swab. When you break a ball (a "Chop!" notification will pop above your head) your accuracy and velocity will noticeably diminish. By swabbing you get up to 95% of your accuracy and velocity back. Sprint: Hold Alt to sprint. Faster than running, you have very limited stamina in which to get a quick burst of speed while making a move; you can also get a sprint boost when crouched/prone. *Note, you cannot shoot while sprinting. Jump: Press Space to jump. You can jump over smaller/lower bunkers only. *Note, you must stand up before you can jump. To understand the mechanic of how the ball flight and bunkers interact (with the short and tall bunkers) you can think of it as a 3D model on a 2D plane. We try to model the ball flight in simulation detail for a 3D flight when possible. Tall bunkers (which are always "brighter" in color) are very simple to understand, they cannot be shot through while standing or crouching. They are tall enough to obstruct your sightline and shotline and will absorb all paintballs. Long story short; play your shorter/darker bunkers tight, explore the 2D/3D ball flight mechanic (offensively & defensively) and learn those angles! Notice: This game is meant to be a challenge! Skilled players (and even bots) may seem outright dominating; use the tips below to help boost your game! Strategy: Work with your teammates, covering positions they can't by suppressing their mirrors, flanking enemies, etc. Find angles, lock down lanes, and make smart decisions when advancing the field! Movement: Running and gunning wildly will get you killed quickly in this game. Play smart, play tight, and shoot those lanes! Peeking: Proper snap shooting form is important to staying alive after getting your kill. Stay tight behind your bunkers, peek fast and shoot, and make sure to lean back into the bunker! Remember, there is probably paint flying back at you, and you can dodge it if you're fast enough! Breakout/Laning: If you are a support player, find a lane and lock it down off the break; getting an early advantage is key to closing out that win. *Don't forget about your own player, as the enemy team may be doing the same! Snake Play: Play the snake tight and know your incoming angles! Watch for the opposing team's snakeside players, they'll be the most dangerous players to your advancement. Bunkering: If an opposing player is crouched behind a short bunker, you can "bunker" them by getting close enough and directly shooting over that short bunker; a "bunkered" notification will show up when a player gets bunkered. Who Hit Me? : Anyone who eliminates you will have a glow around them for 1-3 seconds. Every field will have it's own unique angles (big & small.) Know your angles and find new ones! Bounces: Depending on angle and velocity you may get bounced and not be eliminated. A yellow notification will pop above your head when you get bounced or see another player get a bounce. Trading: If two players eliminate eachother at the same time, a yellow "traded" notification will pop above their heads when they are hit out. "Playing on": Currently after you get hit (your screen will flash red) you have half a second before being pulled out where you can play on. *Every subsequent hit on a player will lower this time. Hit a player numerous times and they will not be able to play on. Loadout: Your players loadout can be customized in many ways; Depending on the game mode and field you are playing on, make sure to gear out and customize your player appropriately! Race to # wins: First team to win # rounds (by completely eliminating the other team / depending on game mode) will win the overall match. After the match a leaderboard and detailed hitlog will show before the next match begins and players are cycled in from the queue. Player Queue: Players can queue and watch matches play out while they wait. Queued players will be cycled in each round until a full 5v5 of human players are playing. If a human 5v5 continues through the end of a match, then the entire 10 players will cycle out and go to the back of the queue. 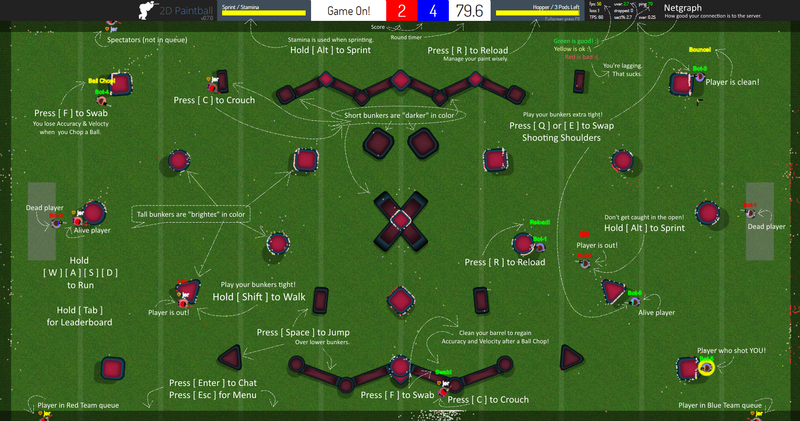 Field/Map Chooser: At the beginning of a match players have a limited time to vote for the next field to play on. *Tied votes will randomly select between the tied maps. Switching Teams: You can switch teams at any time during a match; however, you will forfeit your score and any earned XP when making the switch. A.I. Bots: Bot players will fill slots if there aren't enough human players online. These bots will be cycled out as human players join the field. Taking over A.I. Bots: If you are eliminated you can click on any Bot player on your team to immediately take that bot over and become them. Netgraph: At the top right of the game screen you can monitor your Ping, FPS (frames per second), Dropped (packets), and the server Tickrate. Friendly Fire: Friendly fire is currently OFF during alpha.